Although you probably already know this, I will reiterate it, most dentists advise cleaning your teeth twice a day for 2 minutes. That is 4 minutes brushing per day. But how do you know how long you have been brushing for? Do you guess? Do you countdown? Do you use a watch? A timer? The reality of the situation is that many people guess or do not accurately time how long they have been brushing their teeth for. This sadly results in many, not brushing their teeth for the desired amount of time each day. Cutting short the brushing time, can over time have a negative impact on our oral health. The good news is that many electric toothbrushes are now coming to the rescue with built in timers to help us brush for the right amount of time, and we actually class a timer as one of the most important features to consider in our toothbrush buyer’s guide. In respect to an electric toothbrush it is most certainly a device, an electronic device. 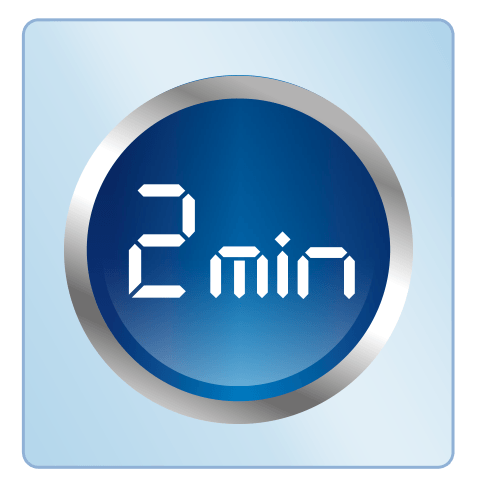 Built into many electric toothbrushes, the timer, counts up (or down if you prefer) to that 2 minutes, from the moment the brush is powered on. Normally the brush will then alert you when the 2 minutes is complete. This alert will be either via a pause or change in sound from the brush head motor or an automatic power-off of the brush at the end of the cleaning cycle. The digital timer built into the brush is accurate and eliminates the guessing that you may previously have been guilty of. I suspect those 2 minutes feel a lot longer! 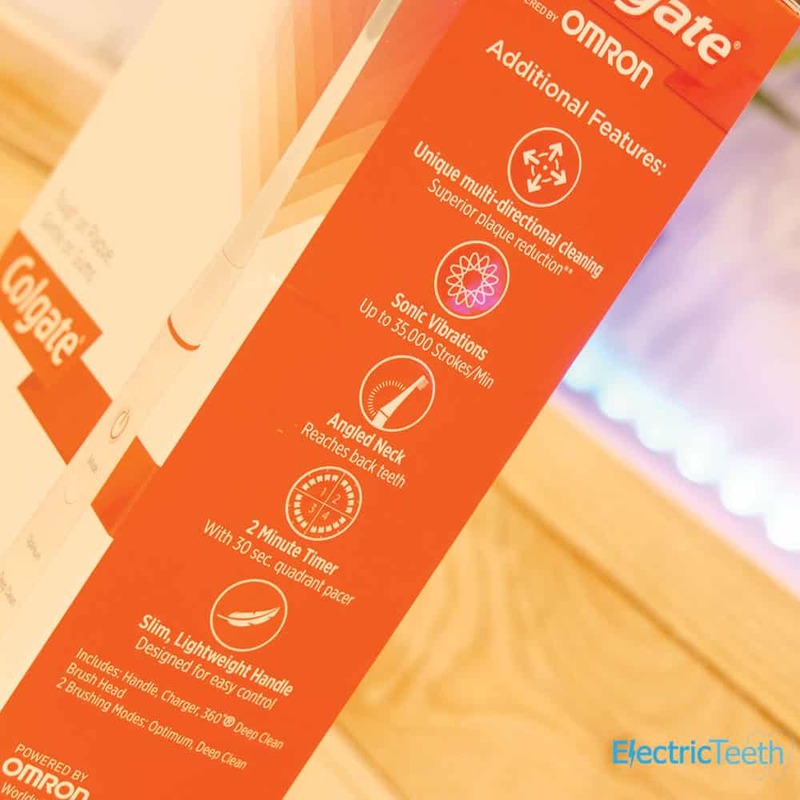 Whilst the ‘standard’ cleaning mode on most electric toothbrushes is programmed for 2 minutes, some cleaning modes such as a deep clean mode, a whitening mode or a tongue cleaning mode will have a different time associated to it. As such the brush behaviour and brushing time alters. A tongue cleaning mode for example may will be set for 15-30 seconds, whilst a deep clean or whitening mode will go on for around 3 minutes. With the most modern of electric toothbrushes, the built in timer is a little more advanced than simply a 2 minute timer. Many have what is referred to as a 30 second or quad pacer. This is like a secondary timer, that runs at the same time as the 2 minute timer. The reason behind this, is that generally speaking the mouth is split into 4 sections. The upper right and upper left quadrant as well as the lower right and lower left quadrant. Each of these 4 sections should get brushing attentions for 30 seconds. This ensures a balanced clean around the mouth and tries to ensure that time is not focused just on the front or back teeth, but an equal time is applied to all teeth. This then is where the quadpacer or 30 second timer comes into play. A typical brushing routine will run like this. Power the brush on, the timer begins running. You begin cleaning your upper right quadrant. After 30 seconds you hear a brief change in the brush motor noise and there is a slight pause in the motion of the brush head movements. This is the 30 second pacer. Mover to the upper left quadrant. After another 30 seconds you hear that same brief change in the brush motor noise and there is a slight pause in the motion of the brush head movements. This is the 30 second pacer again. You have now completed 60 seconds/1 minute of cleaning. Move to the lower right quadrant. 30 seconds pass and the pacer kicks in again. Move to the lower left quadrant. 30 seconds pass and now the 2 minute timer kicks in to confirm the clean is complete. The brush will either automatically power off, or there will be a longer pause in the brush head movements that signifies to you 2 minutes have passed, but you have to now manually switch the brush off. For longer cleaning modes like Deep Clean or Whitening a similar pattern will occur, but the intervals are longer, or extra intervals are added to focus on the front or back teeth for example. Consult the manual for your particular brush and cleaning mode to find out more. Listening to the sound of the brush motor or waiting for a pause in the brushing cycle can seem like a hard thing to become aware of, but trust me you soon get used to it. However some brands of toothbrush, notably Colgate and Sonicare make it very clear to you when the 2 minute clean is up, because they actually turn the brush off completely. I really like this, it is a small but neat convenience. You can of course continue to brush for longer if you wish, but you will need to power the brush on. Popular brand Oral-B do not switch their brushes off automatically. Although the timer is present, you will need to switch the brush off manually, this is to encourage longer cleaning times. Few brushes do this, but on those that do, it is a nice feature. This is something you see on Oral-B models, the Pro/Smart Series 6000 and 6500’s pressure sensor will at 30 seconds and at the 2 minute mark, illuminate the pressure sensor. However rather than the normal red warning colour you get a green light flash instead. I think it is a smart addition and is another visual clue f you are not listening to the rush motor. Slightly newer models including the Genius 8000, 8900 and 9000 have an LED Smart Ring, where the same principle applies but rather than green the LED ring which is always lit when the brush is running just flashes your chosen colour. Same principle but not green in colour. A really underrated feature in my opinion is what is known as a wireless timer, or Smart Wireless Guide from Oral-B. 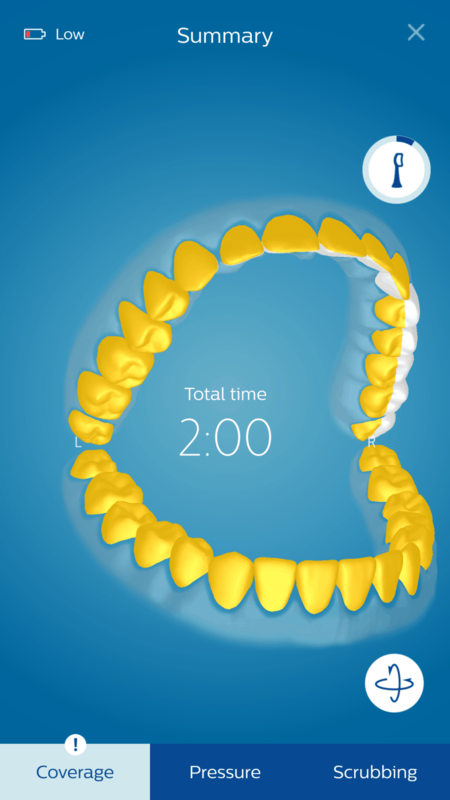 Predominantly seen with older Oral-B models, the Smart Wireless Guide is essentially a small clock like device that is designed to be positioned near you when cleaning your teeth. When not in use it shows the time, but when you activate your brush, it begins showing on screen the time you have been cleaning for. It rates via a star system and via an emotive face how well you are cleaning. A sad face will show with maybe a 2 star rating if you clean for just 1 minute whilst a happy face with 4 stars will show if a full 2 minute clean has been achieved. If you apply too much pressure when brushing, you may also get an angry face on screen. 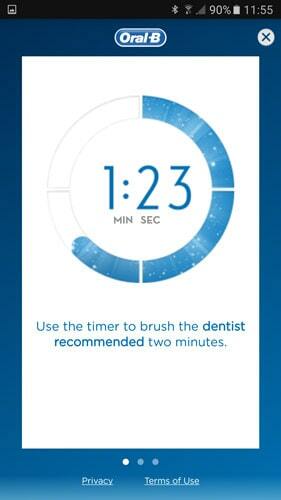 It does also have a guide as to what quadrant of the mouth you should be brushing as the timer counts too. Designed to be an aid, it keeps you focused and motivated to achieve a good clean. I liked this a lot and for children I believe it worked well too as it was a big clear and visible sign. Our Oral-B Wireless Smart Guide article explains what it offers in detail. Sadly this is not a feature that is present in newer models. The Smart Series 6500 is the best option if you like this idea. Initially introduced by Oral-B with their Smart Series brushes, but now also available on the Philips Sonicare FlexCare Platinum Connected brush as well as new entrant Kolibree, is Bluetooth connectivity. This is where the toothbrush communicates with an app on a smartphone wirelessly via a Bluetooth connection. Data is transferred to the 2 devices, to log the cleaning performance and what is going on, but the main displays usually show a bold timer and visual indicators that represent the quad pacer. This is the modern equivalent to the Smart Wireless Guide and built in timer to the brush that works for those who are attached to their phone. Many other benefits do follow, but it is now possible for some models to take advantage of this feature. Which toothbrushes have a built in timer? Most electric toothbrushes from reputable brands have timers built in as standard. However there is also the consideration for quad pacers or 30 second timers, that I explained above. Most do have these too as part of their timer. Rather than presenting a really long list of models, it is in fact easier to list which brushes definitely do not have a timer or quad pacer. Please be aware that every effort is made to keep this list up to date and in line with the leading brands ranges, but models and features do change. Please do check yourself before purchase. It is no science, but generally it is the cheaper toothbrushes that retail for less than £20 that do not have them. This is not a precise rule, but a guide nonetheless. I would generally advise, if you can opting for a brush that offers a timer if you can afford to go for one of these or it fits in with your needs. So far I have been generally speaking about toothbrushes designed for adults and older children rather than really young ones. It is really important to teach children the importance of brushing and there are some great toothbrushes available now that really do promote good oral hygiene to children. Apps for smartphones make the process of cleaning your teeth a game, which makes it more enjoyable for children. A few of the best options can be seen here. However there are some old fashioned sand timers that can work really well as they are engaging. View on Amazon a range of options, and see if it encourages your child to brush for the correct amount of time. Hopefully I have covered all you should need to know about timers and what they do and how they work. However, if I have missed something and you want to know more or have a question, ask away in the comments below. My husband has a smart timer and now i have purchased the same toothbrush and I have one. I have noticed he has come onto my timer when he cleans his teeth are we doing something wrong. I don’t want him on my timer. Are you suggesting you could be brushing your teeth and he then does his at the same time, when your timer picks up his brush? I have seen it before where brushes automatically are detected by the timer. In theory, you have to programme the brushes to the Smart Guide. You could share 1 timer by following the pairing process on this page or pair both brushes to each timer and that should stop the conflict.